In this article we have focused on Water as a vital element for all living species on the earth. 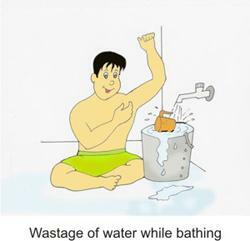 A message has been provided to kids for stopping wastage of water in their daily life activities. Like our previous and first article on <a href="http://www.studyvillage.com/resources/3019-Food-chain-A-flow-life-within-living-species.aspx">Food chain </a> this is our another effort to spread awareness about preservation of our natural resources. Why does water found only on earth in the Solar system? In our solar system, earth is the only planet where existence of life has become possible and the only possible reason is the presence of water on earth. In universe, if we go beyond our solar system, the possibility for existence of extra-terrestrials (Aliens) is only on those universal objects where there is water. In other words it can be said very certainly that water is the vital source of life. Though the water molecules exist on other planets too but there they form other matters there such as vapor and ice which is not sufficient for evolution of life. Water is an essential element for all living beings on earth. This is the primary source of food for root leveled producers (plants) in all Food web on earth. In other words the flow of life within living species starts from water. The chemical formula of water is H2O. 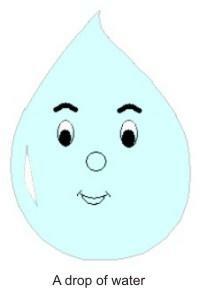 A water molecule contains one oxygen and two hydrogen atoms. Water covers around 71% of surface of earth. Why does water found only on earth in Solar system? The earth is positioned in a habitable zone of solar system. This zone is neither too cold nor hot thus allows the three forms of water to be present simultaneously i.e. solid, liquid and gases. The atmosphere of earth is another reason in which greenhouse effect maintains a steady surface temperature through water vapor and carbon dioxide that is very useful for presence of water. The size of earth maintains an optimum size of atmosphere too that maintains an optimum temperature. If size of earth would be lesser than existing size, the temperature would also exceed which could result to lose of water from earth through evaporation. Ice is the solid form of water which is found as glaciers on hills and icecaps on north and south poles. Fresh found in lakes, rivers, stream, canal and pond etc. where salted water found in the largest water bodies like seas and oceans. Vapors and clouds are the gaseous forms of water. Water continuously flows within the components of hydrosphere in a cyclic form called Water cycle. This flow starts from oceans through evaporation of water to atmospheric air where it converts to condensed clouds. Then precipitation converts it to rain and water reaches to earth. The water flows back to oceans through rivers, streams and other water bodies in various forms like surface water, soil water and groundwater etc. 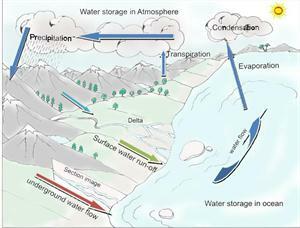 Water cycle is scientifically known as hydrologic cycle. These are the largest water bodies on earth. Water directly or indirectly reaches to oceans through water cycle. This is the process of conversion of water to vapors from water bodies such as oceans, rivers etc. into air. This is the process of conversion of water from plant and animal bodies to vapor and flow to air. Vapor reached to air through evaporation converts to clouds that are carried away to far places on earth. Process of conversion of vapor to condensed air falls to earth in the form of rain. Rain fallen from air flows over land and goes under the earth too where it flows as underground water. Like rivers and streams carry water again to the ocean. Water from other water bodies like lakes, ponds, wells etc. either re-evaporated, reaches underground or used by animals, plants and human beings. Through these multiple ways a cyclic flow of water gets completed. Though there are many climatic changes like volcano eruption, earthquake, tsunami, natural forest fire that can affect water cycle of a specific zone but global warming is the main climatic change which is affecting a number of natural phenomena on earth very fast. Rise in temperature of green house gases on earth leads to increase in earth's atmospheric temperature too. Increase in global temperature will lead to melting of ice-caps on poles which result to addition of more fresh water to sea. This will lead to change in flow of current (natural streams) in sea which is the main source of flow of winds over the sea surface. The change in direction of winds flow will change the direction of monsoon and will lead to rain on un-expected zones and droughts on rainy zones. The increasing temperature over sea surface will intensify the pressure variation that will energize strong hurricanes and increased rainfall due to more evaporation and precipitation. Flooding in rivers will result to disasters in different regions too. Increase in population leading to increasing more urban areas which results to scarcity of natural resources and open areas which badly affects the our natural climatic processes like water cycle. More population needs more natural resources. For our various types of requirements like residence, industries, agriculture, recreations etc. man is used to cut the jungles. The jungle cutting is called deforestation which badly affects the water cycle of different zones. Heat and energy emitted from war weapons leads to increase global temperature which affects water cycle extremely. Nuclear radiation is the worst source of global warming. Beside humans all living species need water to remain alive. All the producers like plants and consumers like birds and animals need water. Mixing of chemical wastages and dirty elements to fresh water makes it dirty and non drinkable which can kill species living in and out of water. This is called water pollution. Detergent, food processing waste, insecticides etc. Industrial by-products, fertilizers used from agriculture, heavy metals from motor vehicles, silts from construction sites etc. Waste hot water released from thermal power projects elevates the water temperature which decreases oxygen in water that kills the fishes in water. Thermal pollution can also release too cold water from reservoirs to the warm rivers. Wastes thrown by us in water bodies, sewage and waste water. The polluted water running-off through rivers and canals reaches in the body of fishes and animals those drink it and also used by plant through photosynthesis. This water contaminates their body and subsequently reaches to human body too when these animal, fishes and plants taken as food and when human drink such water. Cholera and typhoid, vomiting, nervous breakdown and skin diseases are the common health problems that arise due to polluted water. Using more water while bathing. 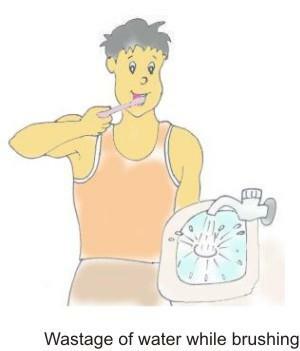 Let the water running while brushing teeth. Ignoring a running water tap even after looking at it. In kitchen using more water while cooking and washing utensils. Deforestation results to soil erosion, flooding and a disturbed water cycle in a specific zone which leads to scarcity of water. The scarcity of water will adversely affect agriculture and industries, which subsequently affects complete social and economical structure. So, the message is to plant the trees as much as possible in your area and enhance reforestation. Keep your surroundings clean to stop water pollution. Polythene is the main source of water pollution. Polythene thrown by us reaches to drainages which results to chocking water flow that causes more water pollution. In this article we have explored very important natural element - 'Water' which the precious gift to us from our mother earth. But intentionally or unintentionally we all are contributing to wastage and pollution of this element. Man is consuming natural resources very fast for his personal benefits and disturbing the nature without thinking over its adverse affects that shall be borne by his future generation. Though we have crossed the limit but still it is most necessary to maintain a balance between nature and humans activities and this requires individual efforts by every human at all fronts wherever his access is possible. We can make efforts to recover from it by controlling human activities like deforestation, making pollution, wastage of natural resources, nuclear tests, wars, and main of the mains is the population growth. Let us make a pollution free environment through preserving our natural resources. Ice-caps: Very large size of thick ice sheets spread over the pole areas. Greenhouse effect: Sun rays entering earth's atmosphere are revert back as thermal	radiations. This radiation is absorbed by atmospheric greenhouse gases, and spread within atmosphere to maintain atmospheric temperature. Green house gases: Water vapor, carbon dioxide, methane, nitrous oxide, and ozone etc. Biological problem: Problem related to living species regarding their cells, molecules, organs, individuals or ecosystems etc. Drinking a large amount of water could help prevent heart attacks. Water provides the brain much needed oxygen to perform at optimum levels. Soft drinks are becoming increasingly more expensive at restaurants; drinking water can be a cheap alternative. Drinking water has the ability to increase your metabolic rate, thus helping your body’s ability to burn fat. Water Pollution: Is It as Big of a Problem as We Think? The product line that was chosen was Water. There are numerous brands that have been developed in the field of water, hence leading to tough competition. But out of the various brands namely Masafi, Gulfa, Oasis, Hatta and Evian. The one with the highest market share was found to be Masafi. This is a great resource that evaluate the very importance of water to the existence of man. Water is life. *. Links to our partners- Connect with federal, state and other partner organizations that also work to ensure Americans enjoy safe water. *. Drinking Water Strategy- Almost one year ago, U.S. Administrator Lisa P. Jackson announced the Agency's Drinking Water Strategy (DWS) to strengthen public health protection from contaminants in drinking water. An update on the goals set and accomplishments is now available. 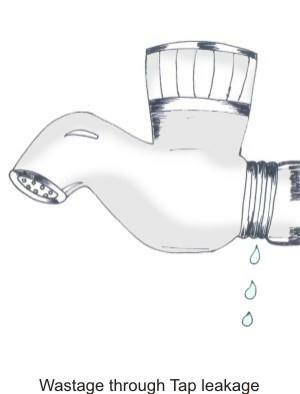 SDWA authorizes the United States Environmental Protection Agency (US EPA) to set national health-based standards for drinking water to protect against both naturally-occurring and man-made contaminants that may be found in drinking water. US EPA, states, and water systems then work together to make sure that these standards are met. *. Standards and Risk Management– Learn about current and proposed drinking water regulations, basic information about drinking water contaminants, the regulatory process, and more. *. Primacy– States and Indian Tribes are given primary enforcement responsibility (e.g. primacy) for public water systems in their State if they meet certain requirements. Millions of Americans receive high quality drinking water every day from their public water systems, (which may be publicly or privately owned). Nonetheless, drinking water safety cannot be taken for granted.